It was Evel Knieval that once said; "I love the feeling of the fresh air on my face and the wind blowing through my hair." Um, yeah...don't we all bruv?! He also said "I guess I thought I was Elvis Presley but I'll tell ya something, all Elvis did was stand on stage and play guitar, he never hit the pavement at 80 mph." Erm.... no. 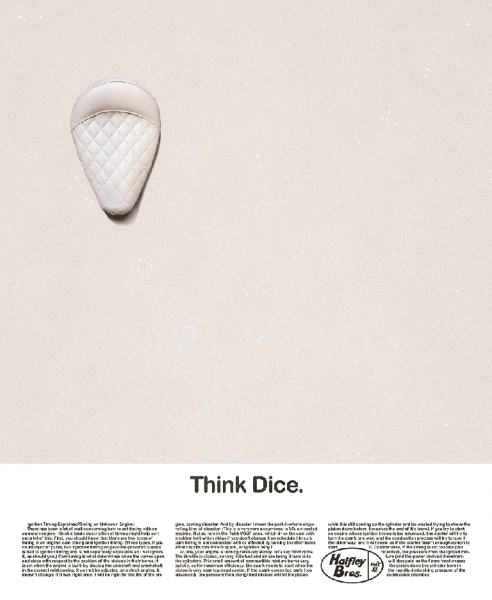 no he didnt However, this particular quote really took the biscuit though; "DicE magazine? Never heard of it." Issue 57 is here and it is in collaboration with our good friends The Haifley Brothers, out there in Phoenix, Arizona. If you haven't already heard of these master craftsmen, you are in for a pleasant surprise. Perfect lines, beautiful curves and just drop dead gorgeous...and that's just the boys themselves! Inside this fandabulous issue you will also find a Show Class Magazine special 16 page insert. The old magazine inside a magazine trick mate. Weiterführende Links zu "Dice Magazine Issue57"
Kundenbewertungen für "Dice Magazine Issue57"